My, oh my. This is going to be a crazy silly happy holiday mystery class. This is brand new from Brooke Connor and it’s going to be so much fun. 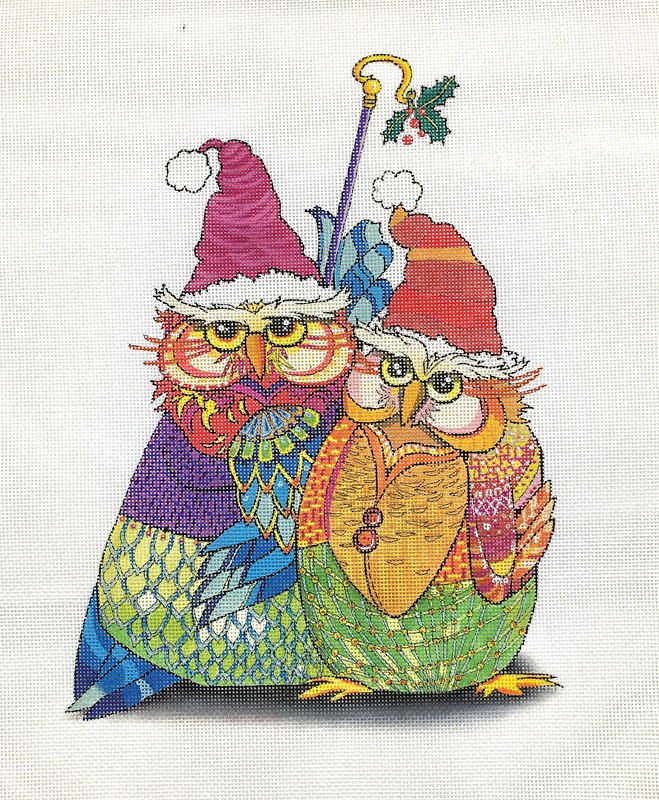 First of all they are owls, second of all they are wearing clothes and then they are under the mistletoe. Could this not be any sillier? We will stitch this canvas together in four lessons! Classes will be December 3rd and 17th and January 14th and 28th Sunday afternoons from 1-3pm. Canvas design area is 10 x 13 handpainted on 18ct canvas. Class cost is the price of the canvas plus $20 per lesson and the threads, beads etc. necessary for that lesson. The canvas cost for this design is $172.00. If you’re attending in person, there is an additional $15 per lesson fee. You will need 14 x 17 stretcher bars. You may also sign up for this mystery long distance and have us send it to you. I’m changing things up a bit with this mystery. You have two options for receiving your long distance mystery. You may receive it in installments as we typically do it or you may receive it as a complete kit at the end of the mystery. Note: We will charge you for each lesson as we go along but hold your kits and ship at the end of the class to help you offset shipping charges. The choice is yours. Just let us know when you sign up.